(Greater Sudbury, ON) As the dust settled in the wake of the 2018 OHL Priority Selection presented by Real Canadian Superstore it was a great day at the draft table for the Sudbury Wolves Hockey Club. The day was carried by the selection and commitment of Quinton Byfield to the Club as the first overall choice and winner of the Jack Ferguson award. The balance of the day allowed the Wolves scouting staff and the hockey operations to select a complement of players that add speed, skill and character to the future Wolves Hockey lineup. Of the newly drafted players, the Wolves scouting staff valued the Leadership quality which can be found throughout the newly drafted players. Four of the top six skaters from the 2018 draft were captains of their teams last season which speaks to the character and qualities that the team was looking for in the cadre of young recruits. The Wolves set up the draft headquarters in the pre-game media room at the Sudbury Arena, surrounded by most of the organization, the enthusiasm was palpable as the draft day unfolded and the first overall selection of Quinton Byfield was confirmed Saturday morning. 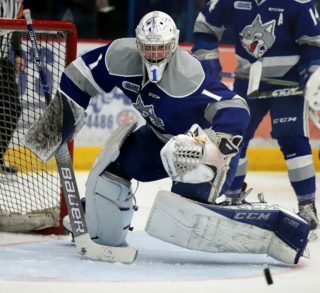 Following the draft, Byfield confirmed his commitment to Wolves fans by signing with the Sudbury Wolves over the weekend. Wolves Fans will get their first chance to see the new draft picks, including Byfield and his #55, this weekend during the Annual Rookie Orientation Camp which will be held at the Sudbury Arena. On Ice sessions will be held Saturday evening from 7-9pm and again Sunday morning from 11-1pm. Season ticket holders will receive free popcorn all weekend and all fans are invited out to see the newest Wolves along side many 2017 draft picks and 3 returning Wolves’ standouts, Blake Murray, Liam Ross and Anthony Tabak.